"Sampath Speaking" - the thoughts of an Insurer from Thiruvallikkeni: 'Ramanujan' ~ romantic on the mystic Kanithamethai of our land ..
'Ramanujan' ~ romantic on the mystic Kanithamethai of our land ..
Great if you can identify this two persons… one is the director and the other cinematographer of the cinema that this post is about !!! and it is on one of the most romantic stories in the history of Maths that dates back to 1900s. December 22, 2011 marked the 125th birth anniversary of the mathematical genius Srinivasa Ramanujan. At Madras University, our Prime Minister Dr Manmohan Singh inaugurated the year long celebrations of 125th birth anniversary of mathematician Srinivasa Ramanujan. On that occasion, PM declared December 22(Ramanujan's birthday), as the National Mathematics Day and 2012 the National Mathematics Year. Dr. Singh also released a commemorative stamp on the occasion. It does not require any poll result to show that most school students consider ‘Mathematics’ as the most difficult. The meaning of ‘Mathematics’ is the systematic treatment of magnitude, relationships between figures and forms, and relations between quantities expressed symbolically. It is something difficult; something that could not be done easily or readily done. Can modern day children answer simple Qs without a calculator ? How popular is ‘Elements’ the mathematical treatise written by Greek mathematician Euclid inAlexandria c. 300 BC ?? Maths is perceived to be tough and exacting involving the brain power though it continues to be the essential tool in many fields of application. It is the history of a great genius – Ramanujan born on 22nd Dec 1887 to K Srinivasa Iyengar (a clerk in a Saree shop) and Komalammal. They lived in a traditional house in the town of Kumbakonam, which is now a museum. He did not have great formal training in pure mathematics but made extraordinary contributions to mathematical analysis, number theory, infinite series and continued fractions.One must acknowledge the English mathematician G. H. Hardy who was so moved by the strange letter from an unknown clerk in Madras, India. The ten-page letter contained about 120 statements of theorems on infinite series, improper integrals, continued fractions, and number theory. Hardy wrote enthusiastically back to Ramanujan, and Hardy's stamp of approval improved Ramanujan's status almost instantaneously. Ramanujan's years in England were mathematically productive, and he gained the recognition he hoped for. Cambridge granted him a Bachelor of Science degree "by research" in 1916, and he was elected a Fellow of the Royal Society (the first Indian to be so honored) in 1918. But the alien climate and culture took a toll on his health. Ramanujan's talent was said by the English mathematician G.H. Hardy to be in the same league as legendary mathematicians such as Gauss, Euler, Cauchy, Newton and Archimedes and he is widely regarded as one of the towering geniuses in mathematics. He became a Fellow of the Royal Society and a Fellow of Trinity College, Cambridge. It is a remarkable tale of a genius who struggled throughout his lifetime but hailed so much in the modern World. He was married to a nine year old bride Janaki ammal. He had a medical problem but his family did not have the money for the operation. He searched for a job, stayed at friend’s house while searching for clerical position. Upon coming to Madras, Ramanujan and his wife resided in George Town. In May 1913, Ramanujan joined the University of Madras as its first research scholar and he first moved, for about 10 months, to Hanumantharayan Koil Street (in our own Triplicane – the lane that leads from Kairavini – the tank of Sri Parthasarathi swami temple), and then to Thoppu Venkatachala Mudali Street - both in Triplicane. His wife and mother lived with him for some months, at the latter residence before Ramanujam left for England on March 17, 1914. Quite unfortunately in 1920, he died in 1920 due to illness, malnutrition and possibly liver infection. He was only 32. !! Now getting back to that photo – ‘Ramanujan’ is an upcoming biographical film based on the life of renowned Indian mathematician. The film is being produced by the independent production house Camphor Cinema and directed by Gnana Rajasekaran, who has also penned the screenplay. Set in the early 1900s, the film traces the life of the prodigal math genius Srinivasa Ramanujan from the time he was a young Tamil Brahmin to his years in England, where he attended Cambridge University during World War I. The film follows his relationships with his mother Komalatammal, his wife Janaki, and his collaborator Professor G. H. Hardy. The film will also showcase how Indian society viewed a mathematician of such great stature. Gnana Rajasekaran is no stranger to us……….. his directional debut was ‘Mogamul’ in 1994 which won the Indra Gandhi Award for Best First Film. He has also created Bharathi (2000) and Periyar (2007). Rajasekaran has won four National awards, three Tamil Nadu state awards, and his movies have been screened at international film festivals, including the IFFI. He was appointed to IAS and was allotted the Kerala cadre. His film ‘Barathi’ was a good depiction of Mahakavi Subrahmanya Bharathiyar – the film starring Shayaji Shinde won 4 National awards and 6 state awards. 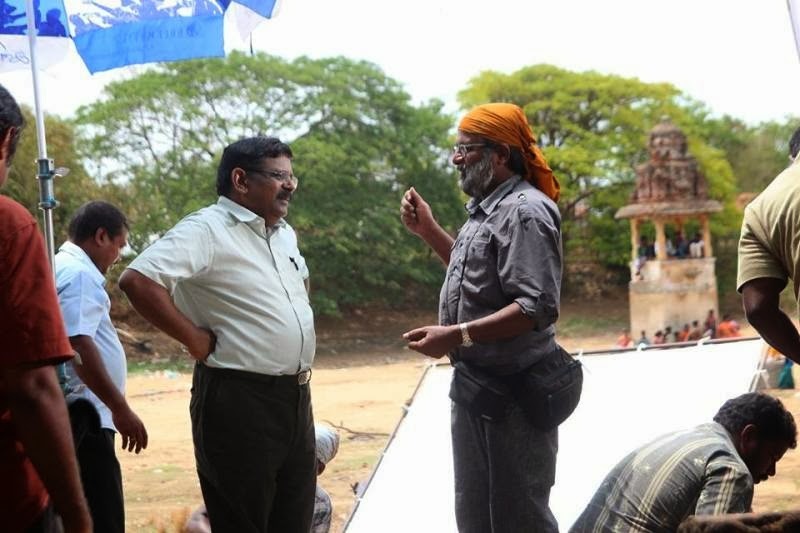 Sunny Joseph from Kerala is the cinematographer for the film ‘Ramanujan’. Eager to see the life of Kanitha Methai Ramanujan on silver screen…. Appreciate the efforts of Gnana Rajasekaran. I am looking for information on Komaltammal post Ramanujam's death. Do you have any information on the events leading between his arrival back from London and his untimely death in Kumbakonam?